The Laser Relativity Satellite (LARES) will allow Italian astrophysicists to measure the frame-dragging effect of general relativity up to an accuracy of 1%. 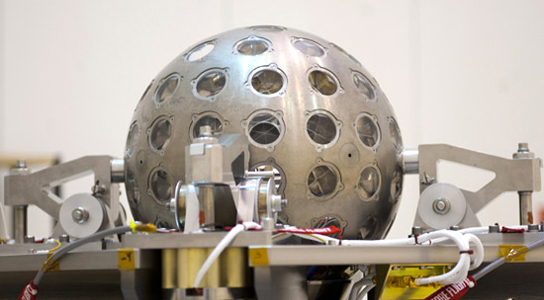 Laser ranging stations on Earth will fire lasers at LARES to calculate its distance and orbit, with a high degree of precision. This precision is what’s necessary to determine frame-dragging, the Lense-Thirring effect, which is what general relativity predicts will happen when an object with a gravity well like Earth spins. 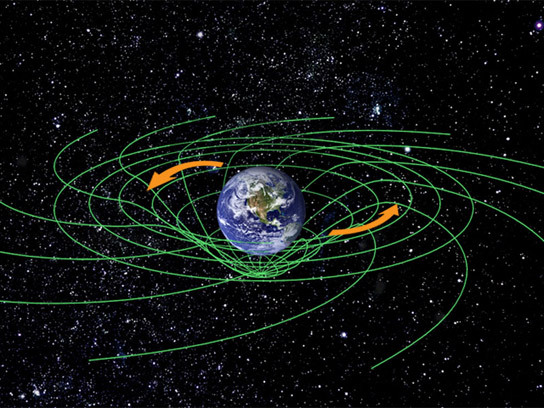 Relativity states that massive objects can have some measurable effects on spacetime, even more so when they spin since they will drag spacetime around into the same direction of the spin. The local twisting of spacetime can have some strange effects, such as light on one side of the spin moving faster than on the other side. Such orbital procession is somewhat hard to detect, since the frame-dragging only amounts to about one part in a few trillion. Over time, it’s hoped that LARES’s orbit with shift eastward by a couple of feet per year, which could help determine the intensity of Earth’s frame-dragging. There’s some skepticism that this will be possible, but it’s hoped that by 2016, there will be some experimental proof of the frame-dragging. 1 Comment on "Laser Relativity Satellite to Measure Frame-Dragging Effect of General Relativity"
Kinetic energy of a rotating body like Earth will increase gravity but more in the sense of classical force than classical aether!